Spring and Summer in New Zealand represent all of the best things about our country. Camping, picnics, BBQs, socializing and always great food. It’s the time of year where our sweetest produce is abundant: new potatoes are as popular as strawberries and with as much nostalgia and tradition surrounding them. It was with all this in mind that the NMNP event was created and 2018 is it’s second incarnation. This year, the idea was to create a festive ambience, similar to that of the Beaujolais festival in France, but on a smaller scale of course. 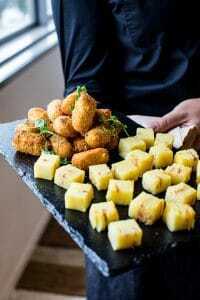 Special potato-esque canapes, an urban foody location, live music (French Accordionist – Tracey Collins), celebrity guest Annabelle White and quite possibly the first ever blind tasting of new potatoes in the world! The idea being that varieties would be identified by taste, colour and texture, subsequent to meeting and interviewing growers earlier in the night. Among the prizes some gorgeous potato-themed art, from Hawkes Bay artist Bernard Winkels, a potato enthusiast of Dutch and Irish heritage. 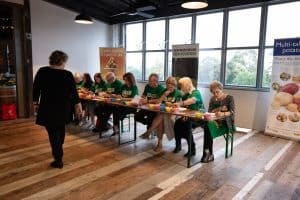 There was a relaxed yet celebratory mood all night and it was an opportunity for Food Writers of NZ to meet growers and for growers to have their moment in the spotlight and describe special characteristics of their particular produce and stories of their potato farming businesses. Although fresh producers tend to be a humble bunch, their stories are rich and stretch back generations. The 5 commercial growers who made the journey to central Auckland to celebrate the new season were, Balle Brothers, Gropak, Oakleys and Wilcox. 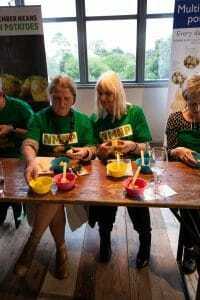 It is hoped next year the festival will grow a little broader and more growers might join in the festivities.